On April 20, 2010, nine Latino students chained themselves to the main doors of the Arizona State Capitol in an act of civil disobedience to protest Arizona’s SB 1070. Moved by the students’ actions, that same day Francisco X. Alarcón responded by writing a poem in Spanish and English titled “Para Los Nueve del Capitolio/ For the Capitol Nine,” which he dedicated to the students. The students replied to the poem with a collective online message. To share with the world what was taking place, Alarcón then created a Facebook page called “Poets Responding to SB 1070” and posted the poem, launching a powerful and dynamic forum for social justice. Since then, more than three thousand original contributions by poets and artists from around the globe have been posted to the page. 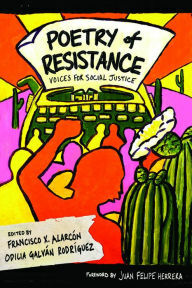 Poetry of Resistance offers a selection of these works, addressing a wide variety of themes, including racial profiling, xenophobia, cultural misunderstanding, violence against refugees, shared identity, and much more. Bringing together more than eighty writers, the anthology powerfully articulates the need for change and the primacy of basic human rights. Each poem shows the heartfelt dedication these writers and artists have to justice in a world that has become larger than borders. Poetry of Resistance is a poetic call for tolerance, reflection, reconciliation, and healing. The events that occurred in Arizona in 2010, and Arizona's SB 1070, were the subject of extensive discussions and debates at my home and among friends and family. As immigrants, none of us took these events lightly, particularly since at the time it seemed to be setting a dangerous precedent that would affect the civil rights of a large percentage of the population. As a result, I found myself identifying with many of the poems included in Poetry of Resistance. In today's toxic and divisive political atmosphere, this powerful poetry volume is both relevant and sorely needed. Perhaps more so than ever. As an example, I've chosen to highlight one of my many favorite poems. stone unfurling in our navels. the comets, the desolate inconsolable moon. of knowing, our present tense. Juan Felipe Herrera, U.S. Poet Laureate: "Borders can be overcome with the revolutionary tenderness of poems. This anthology is an incredible assemblage of voices and letters that proves that collective poetry is the answer to the violence-filled policies that increasingly face us in these times." It's beautiful and powerful Hils. Yes Leslie. It truly hit me where it counts. Update & Impressions of a Reader Turns 7!